And commenter number 4000 is…. I e-mailed you and you will get a gift from me soon! I had my friends Tracy’s name for the Christmas exchange in our stitching group. I was super busy and needed extra time to do the finishing on it etc. so Tracy was gracious enough to give me all the extra time I needed to be able to finish it up as I wanted. I mailed her package about two weeks ago and she got it yesterday. She e-mailed me and told me she absolutely loved it so now I can share a picture of the finished product with you. 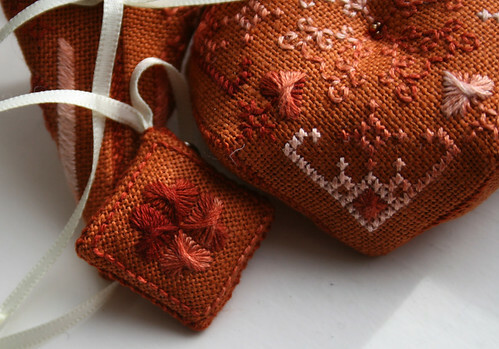 Little Women Series by Little House Needleworks finished as a pillow. The photo is really dark. 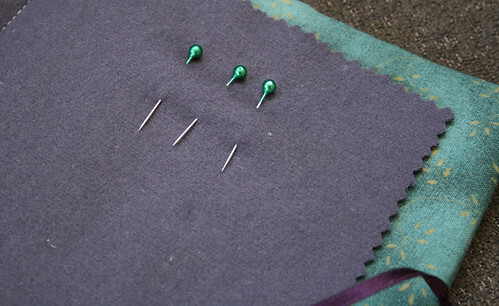 The fabric around is green and the corners are purple. The back has the same purple fabric as the corners. I thought green would work best with these designs because each of them has something green in them so that was the only color they all had in common. I wanted to have something purple too since that is Tracy’s favorite color. Here you can see the fabric better, the other photo is a bit dark. 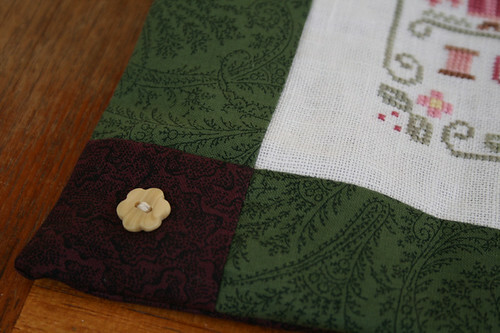 I added these cute wooden flower buttons to each corner as I thought the pillow needed a little something extra. I am going to ask Tracy to take a picture of it stuffed and hopefully in daylight. It was still dark for so many hours a day when I took that picture that it didn’t turn out that well. She also had a birthday in February so she also got the Bourse I made during the Finishing weekend at my house. Tracy I am so happy that you liked what I made for you and once again, I am so very sorry that the gifts were so late. Just a reminder about this post. The number is getting closer and commenter nr. 4000 will be here before you know it. 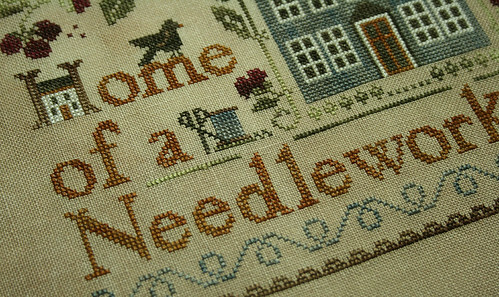 I have been secretly stitching away on this for the last couple of days. This is a birthday gift for my fathers sister who is turning 50 tomorrow. I am pretty sure that she doesn’t know about my blog (I even called my mom to make sure) so I am taking my chance with posting these pictures here. 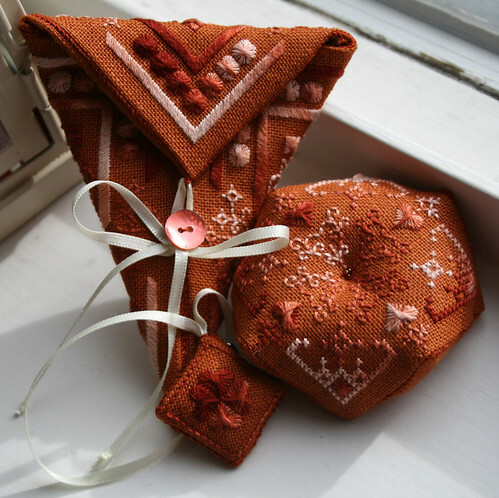 If you have been reading my blog for some time, you will know that I have done both of these patterns before. I am still not sick of them. To me it feels like if you play around with different fabric and threads and colors, you get a completely different outcome every single time. I love how this turned out. I was having a hard time figuring out the perfect floss to go with that fabric because her favorite color range are orange colors. So I knew I wanted to use this fabric, but I didn’t figure out what floss to use with it. One night my mom came over, and the genius that she is, spotted this floss right away. 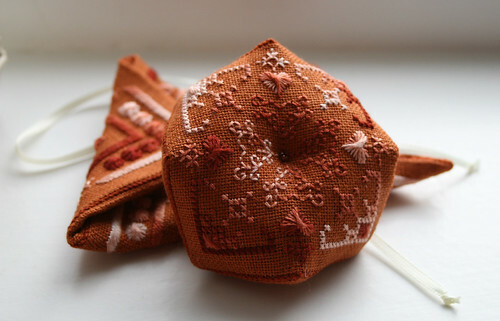 I started stitching and it just turned into this amazing set of smalls in my hands. I hope you enjoy these pictures. Next up is doing the finishing on the Bloggaversary gift for Jennifer. Yeah, I am way behind but things have been quite busy around here. 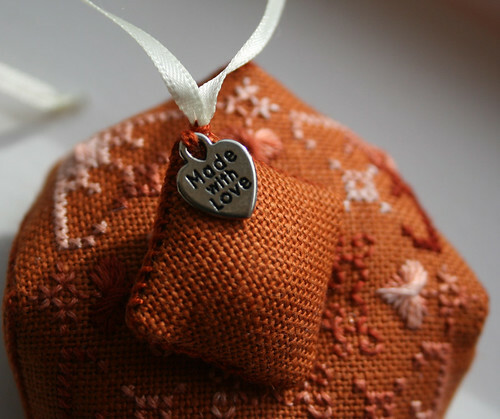 I just hope that the finishing that I have in mind for that certain gift turns out as good as I hope. Wish me luck! 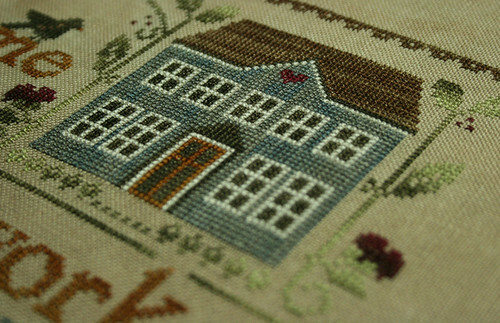 I really, really enjoyed stitching this pattern. 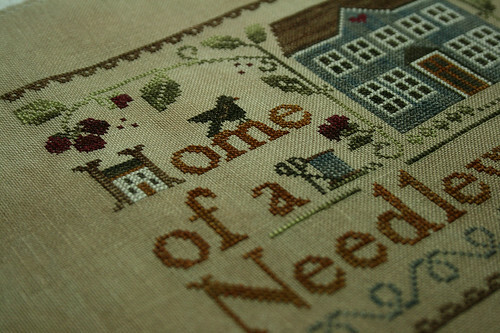 The design is fun and very fitting for me and my needleworker home, the fabric is just gorgeous, the threads are fun and have beautiful color and variation to them and I love the finished result. I started this a while ago (about a month ago or so) but put it down while doing some finishing and knitting and other stuff. I mailed the finishes I was doing to both Tracy and Brenda on Tuesday so I went back to stitching this today and managed to finish it today. I have been sick (yes, again!) with strep throat infection and went home from work with a high fever on Tuesday and was home yesterday and today. I think I am good enough to go to work tomorrow though. Anyway, here are some pictures. I love the little details all over this pattern. I never really noticed them until I started stitching it. I never should have signed up for Ravelry. Hah! If you have ever knitted and want to be bitten by the knitting bug again, Ravelry is the place to be. I have spent way to many hours there lately, looking at some yarn goodness, patterns, needles etc. Oh I love it! I have been decided that my next knitting project will be this cape. I love everything about it. It is just oh so me! It has my name written all over it! The only thing I do not like about the original is the color, if I dress in a color like that I look dead. Seriously. I need strong colors for my skin, hair and eye color. 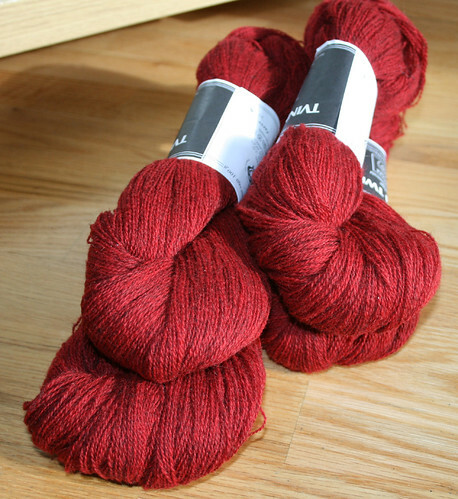 So today I went to a local knitting store, Nálin, to pick up yarn for it. 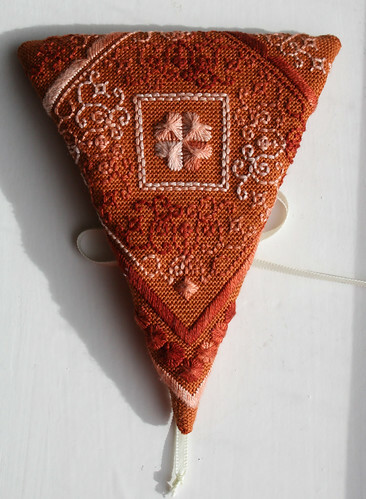 The pattern is free if you buy the yarn there. Now, they have great selection of yarn but are a little pricey. I love the yarn I picked out, even though it was pricey. Very pricey. Oh well, it is not like I am stocking up on yarn (yet!!). See! Much better color for me. I am so in love with it! I think it is going to be so pretty when finished and I can’t wait to start. The only problem is the pattern. It is in Danish, and I am not very good at reading and understanding Danish. I will manage though. Google is my friend and I know plenty of knitters that read patterns in Danish and whatever language. So I will be ok with the help of my knitting friends. Now, I think I am going to cast on and get started. Oh yes I am! I finally got around to doing the finishing in the last piece that my friend Brenda sent me to do finishing work on. 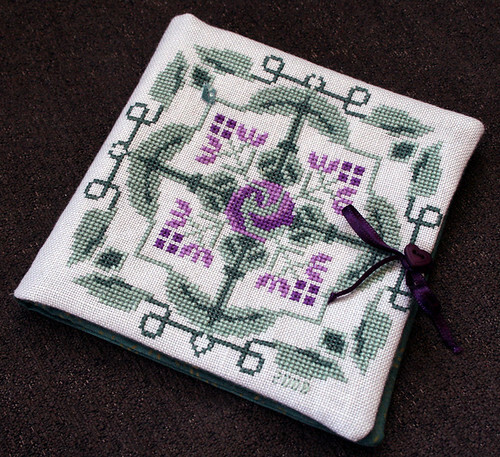 I had no clue what to finish this as, but someone suggested a needlebook and since I had never made one, I decided to go for it. It felt great to sit down last night and do some crafts after the past few days. So here are some pictures of the finished result. Front view – Stitched by Brenda – Finishing done by me. 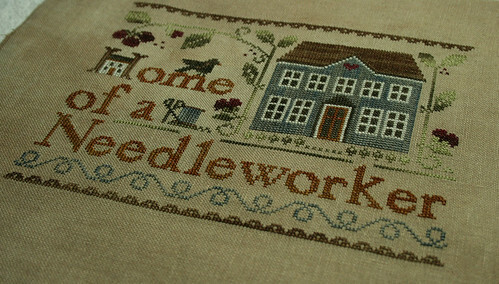 Inside view – Stitched by Brenda – Finishing done by me. 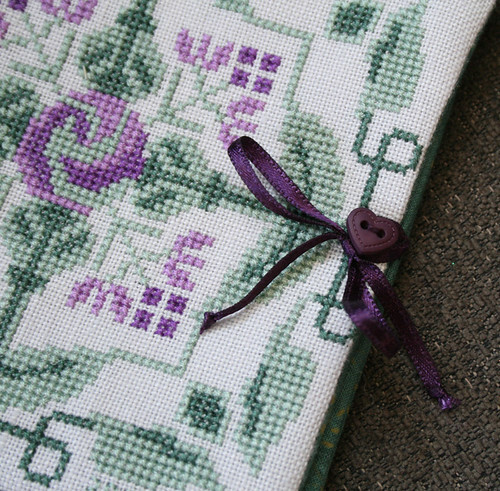 Close up of the button and ribbon – Stitched by Brenda – Finishing done by me. 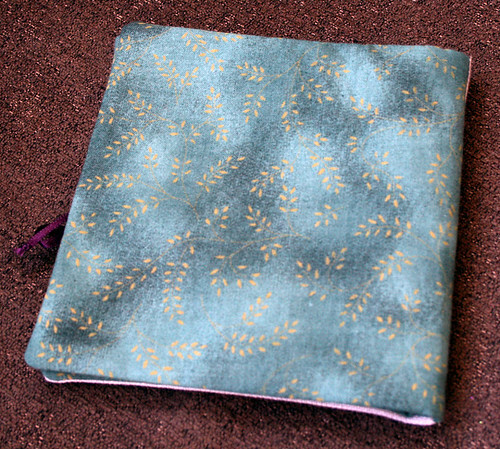 Fabric on the back and inside – Stitched by Brenda – Finishing done by me. I hope you like it honey! And Brenda and Tracy, I am going to try to mail your goodies tomorrow if work is not too hectic. If not tomorrow, then on Monday! Love ya girls!